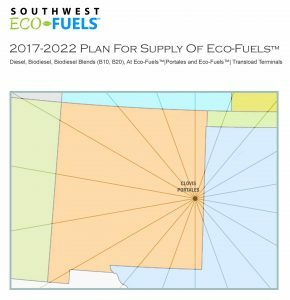 Natural Chem has developed a comprehensive plan to supply clean burning fuels such as ULS Diesel and Biodiesel Blends (B10, B20) that can supplement the diesel supply in target markets such as the Southwest. These fuels comprise the Eco-FuelsTM that will be offered by Natural Chem at its Eco-FuelsTM Terminals. To implement Phase I of the Eco-FuelsTM Program, Natural Chem has acquired the former Abengoa ethanol plant in Portales, NM which will be a regional hub for Natural Chem’s storage and distribution of the Eco-FuelsTM. This facility, called the Eco- FuelsTM|Portales Terminal, has rail and truck access both to receive and loadout the Eco- FuelsTM. It also contains several million gallons of storage for diesel and biodiesel. The Portales Eco-FuelsTM facility will use a state-of-the-art Accuload III in-line blending system to enable it to supply either ULS diesel or biodiesel blends (B10, B20) to truck tank trailers at a load-out rate of 400 gallons per minute (gpm). The Eco-FuelsTM|Portales terminal is scheduled to start operations by the end of May 2017. The first of the Eco-FuelsTM|Transload Terminals will be targeted to start operations by the end of July 2017 with locations in Albuquerque, Roswell and Las Cruces targeted. When supplying diesel to regional fleets and industrial users, Natural Chem will offer prices at its racks that represent a discount to the cost of buying diesel from a more distant rack, considering the cost of transportation and driver time. When supplying biodiesel blends to fleets and industrial users, Natural Chem will offer them at a discount to its rack diesel prices. Generally, the discount will be $0.02 to $0.03 per gallon depending on the blend (B10 or B20). A volume discount will be offered to large buyers of the Eco-FuelsTM products that sign a supply agreement specifying a minimum volume of monthly purchases. 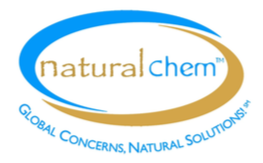 Natural Chem also will market biodiesel (B99) to regional refiners who need this product to meet renewable fuel mandates under federal Renewable Fuel Standards (RFS2). FUTURE EXPANSION OF THE BIODIESEL AND BIOGAS PROGRAM TO OTHER REGIONS OF THE U.S. The Natural Chem Eco-FuelsTM Program in New Mexico and the Southwest Region will be the blueprint for Natural Chem’s future development of similar programs in other regions of the country. Financing: $140 MM budget using taxable, conduit bonds issued by state/local entities. Equity as required. Economic Performance: Facility includes 3 standalone operations: large scale biodiesel and glycerine production and small scale LNG/CNG. Each operation is profitable and overall performance shows 9x DSCR. Goal: Development of large-scale 90 million gallons per year biodiesel plant, 90 million pounds per year glycerine plant, and small scale LNG plants up to 40,000 gallons per day. Future expansion to midscale LNG. Method: Use Of Existing Assets: Development of Eco-FuelsTM Complex using extensive infrastructure available within the Clovis Industrial Park, New Mexico. New rail spur and rail yard to site of new Eco FuelsTM Complex to enable use of Midwestern corn oil. Modular technology facilitates development. Region: Heart of agri-industrial area in Eastern New Mexico and West Texas producing grains, dairy products and oil & gas products. Regional refiners and fleets are target customers for Eco-FuelsTM. Site/Infrastructure Advantages: Substantial savings over the cost of greenfield development of infrastructure. Construction schedule 6 months faster using existing infrastructure at Clovis Industrial Park.